Size: 5.6" x 3.0" x 0.75"
We wrote the year 1980, when Texas Instruments discovered the lower labor costs of Taiwan, R.O.C. compared to US or Europe. 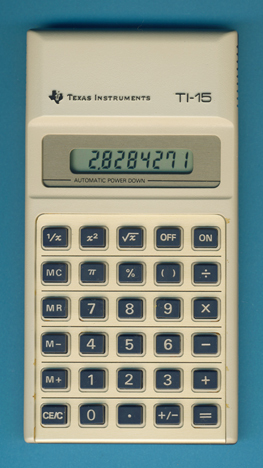 Until the early 1980's most calculators from Texas Instruments were produced either in US or Italy and some early LCD models like the TI-25 even in Japan. Texas Instruments introduced together with this TI-15 a whole variety of calculators manufactured in Taiwan, for instance the TI-18, TI-21 and TI-1100 models. Compared with US-built calculators of that era, like the slimline model TI-30-II or the early slanted model TI-55-II, these first calculators assembled in Taiwan look and feel cheaper. But these calculators were just the first movement of a major wave in outsourcing of manufacturing, ten years later advanced calculators like the TI-85 were assembled in Taiwan and the lower-end models either in Thailand or China. Since about 2002 all Texas Instruments calculators are manufactured in different plants in China and in 2015 we witnessed the first Texas Instruments calculators manufactured in the Philippines. The designation TI-15 forces this calculator to the Scientific section, actually it features lacks the xn-function found on the TI-1020 basic calculator. Dismantling this TI-15 assembled in August 1982 by an unknown contract manufacturer in Taiwan reveals a pretty simple design based on a not yet identified single-chip calculator circuit. © Joerg Woerner, May 13, 2002. No reprints without written permission.